In the late '80s, Japan's Sigh were known as a curious aberration, one of only a handful of bands outside of Scandinavia to have partaken in black metal's second wave. Yet, despite their historic significance, Sigh never felt as if really belonging to that scene. Inhabiting a bubble of their own and uninhibited by expectations, Mirai Kawashima and his cohorts toyed with black metal's symbolism and genre markers, meshed them with a cornucopia of elements from outside the genre, and created their own mangled stream of consciousness. Sigh's reliance on this approach meant that the band's style became impossible to pinpoint. It meandered between eclectic takes on avant-garde metal, stumbled through trippy electronica and progressive rock laced experiments, and ultimately found itself closest to black metal on 2012's In Somniphobia, a deranged symphonic mayhem and arguably the group's most accomplished release. After In Somniphobia's similar and oddly consistent follow-up Graveward, Sigh's 11th full-length Heir to Despair finds them absorbing new genres and redefining their approach once more. On it, they hone a sound that is comparatively bare and closer to metal basics, sprinkled with repurposed style lines touched in the past, but also for the first time heavily influenced by Japanese folklore and music. Rather than reflecting on Heir to Despair through the prism of what came before it, the record is best experienced on its own. In Kawashima's words, it's a stylistically diverse exploration of madness, but one that doesn't translate into chaotic and bombastically delirious music. Instead, it thrives on evoking a more unnerving and subtle kind of fright imbued with psychedelia and a sense of dread that has more in common with psychological horror than gore and slasher films. The everpresent hypnagogic delirium that creeps in the corners of Kubrick's The Shining similarly lingers in Heir to Despair's every note and progression. Even the album's cover—Eliran Kantor's deceptively simple and clean portrait in a reimagined ukiyo-e style—hides in plain sight the lunacy of its subject that waters dead flowers while a threatening, demented smile flashes across her face. This sort of elusive and illusive dichotomy infects the music and creates a duality in the material's flow. The introductory "Aletheia", for example, opens as an oriental-sounding mid-paced cut lead by shamisen and sitar strums and light percussive touches only to be kickstarted by Sigh's trademark, fuzzy guitar leads. Krautrock rhythms, black metal tremolos, '70s prog rock ornaments, and psychedelia all intertwine as vocoder and raspy vocal incantations clash in a mixture of Japanese and English lyrics. While the addition of sparkly folk ornaments makes the song appear complex, its underlying structure is beautifully simple and broken only by a scratchy epilogue complete with haunted electronic effects. But beyond "Aletheia", the album feels consciously disjointed and fragmented, as if its story is not meant to be followed linearly. The segue from "Aletheia" into the faster and straightforward "Homo Homini Lupus" is strange and abrupt, while the following two standout tracks—the infectious theremin and groove-laden "Hunters Not Horned" and the ferocious, galloping "In Memories Delusional"—appear to stand on their own, disconnected from what came before them and from what's ahead. And what follows "In Memories Delusional" is Sigh's darker and more convoluted side encapsulated in the central "Heresy" trilogy. Moving from a dubby, glitchy, electronic torrent of sounds on "Heresy I: Oblivium", Sigh dissipate into short fragments dominated by distorted vocals akin to the Residents' avant-pop on "Heresy II: Acosmism" and achieve a Lynchian climax reminiscent of Disco Volante-era Mr. Bungle on "Heresy III: Sub Specie Aeternitatis". The band confidently glides through these cuts grasping for flourishes of prog rock, trip-hop, synthpop, and neo-psychedelia. It's a cohesive array of sounds despite the almost absurd mashup of tropes. Yet when the trilogy ends, there's another abrupt jump. "Hands of the String Puller" is a welcome scorcher with frolicky flutes, but it breaks the flow before the epic ten-minute title track closes the album and marks another peak. "Heir to Despair" is both a fusion and counterpoint of what came before it, a sort of a companion piece to the "Heresy" trilogy and a distillation of the preceding tunes. In a discography full of records that sound unmistakably like Sigh despite often not sounding anything like each other, Heir to Despair fits in perfectly. The instantly recognizable riffs, inspired songwriting bits, a production that is just a bit muffled and just a little bit off, the passages of black metal aggression, and a general feel of insane joy are all still here and should delight fans. 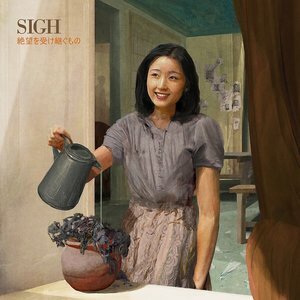 Simultaneously, because of its structural simplicity, Heir to Despair might be Sigh's most approachable record, one that doesn't attack the listener but instead develops its demented ways insidiously. Whichever way you choose to see it, it is an accomplishment.